Believed to be the first military aircraft pilot of African descent, Ahmet Ali Çelikten (birth name ?zmirli Alio?lu Ahmed, a/k/a Arap Ahmet Ali) was born in the coastal city of Izmir (formerly Smyrna), Turkey. Some sources claim he was the grandson of a concubine slave from Nigeria; that his mother, Zenciye Emine Hanim, was a Yoruba woman, and his father, Ali Bey, was of Arab and/or Turkish and African heritage (possibly Somalian). His mixed racial ancestry was testimony to the Ottoman Empire’s participation in the slave trade that for centuries brought in non-Muslims called “Zanj” primarily from East and Central Africa. Intent on becoming a sailor, in 1904 Çelikten entered the naval military school Haddehane Mektebi (School of the Rolling Mill) whereupon completion in 1908 he was commissioned first lieutenant (Üste?men). As World War I approached, the Ottoman military recognized the need to assemble an air force and began training pilots. Çelikten commenced his air cadet training in 1914 at Deniz Tayyare Mektebi (Naval Flight School) at Ye?ilköy near Istanbul and graduated November 11, 1916, several months before Frenchman Pierre Réjon and the American Eugene J. Bullard (the man usually given credit for being the first black military pilot) earned their wings in France. Unlike Bullard, few details are known about Çelikten’s combat record in the Ottoman Air Force during World War I on behalf of the Central Powers (Germany, Austria–Hungary, Bulgaria, and the Ottoman Empire). It is known that before the war started, he briefly participated in flight training in France with a group of seven other Turks and that in December 1917, in the midst of hostilities, Çelikten was sent to Berlin, Germany, for advanced training. It was also during the war years that he was promoted to captain (Yüzba?? ), that his younger brother was killed in battle, and that he married Hatice Hanim (1897–1991), a Greek woman who had immigrated from Preveza, with whom he had five children. Though he remained in the military until he retired in 1949, Çelikten’s career during the post-war decades has not received much attention from researchers. In the early 1920s during the War of Turkish Independence, he was sent to outpost air bases on the Mediterranean and the Black Sea mainly to observe from the sky and report on the movements of enemy British, Italian, Greek, and French vessels. In 1928 he was appointed an undersecretary at air force headquartered in Konya. Among his military decorations was the Bahri Aircraft Medal. 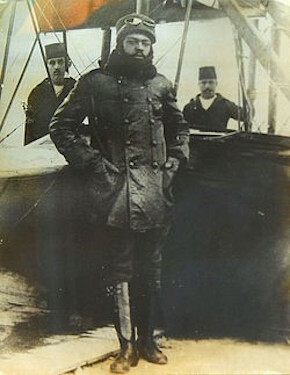 Perhaps Çelikten’s signal accomplishment in the second half of his life was that he inspired members of both his immediate and extended family to become pilots. Not only did his wife, sister, his two sons who served in the air force, two daughters, and a niece and a nephew become pilots but also other relatives to the extent that aviation was said to be the “family’s business.” His son, Yilmaz Muammer, retired from the air force and worked for Turkish Airlines, the nation’s national flag carrier airline. Güntay ?im?ek,“?lk siyahi pilot bir Türk'tü,” at http://www.haberturk.com/yasam/haber/1005175-ilk-siyahi-pilot-bir-turktu; “Ahmet Ali Effendi: World’s First Black Pilot in the Ottoman Muslim Empire,” at https://rasoolurrahmah.wordpress.com/2014/08/29/ahmet-ali-effendi-worlds-first-black-pilot-in-ottoman-muslim-empire/.